NZHN, NZNR, Port of Napier, NZWN (2 versions). Last edited by Snowman on Sat Jan 26, 2013 10:18 pm, edited 1 time in total. Currently well into construction,..................... NZPM Palmerston North International Airport. Photoreal type terminal, and loads of other detail. Any interest in this one being released ???? I'll put my hand up! Sorry, but you will have to provide your own "Crappy weather". It's tropical here, we've had at least 1 hour of sunshine today. We like to think of it as character building. I've grabbed works digi camera so will get Mike some pics of the terminal over the weekend. Obviously Mike has told you what he needs in the way of shots of the terminal, but any other buildings you can get decent shots of would also be helpful, particularly the 2 large hangers by the terminal, Massey College area and GA areas. Shots of the tower and firehouse would be good too, might be able to squeeze in a photoreal tower etc as well in the scenery. Any idea when the Port of Napier might be available? Sorry Ran, ive been kinda dragging the chain on the Port of Napier. Gotten so involved in Palmerston North., and a couple of other sceneries that im working on as well. Port of Napier has been uploaded to Avsim. Beautiful Lawrie - many thanks for your effort! 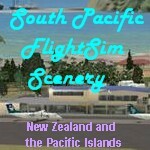 Im currently building a scenery for NZGS Gisborne Airport for myself. This wont have any custom buildings in it, all objects will be from the Runway-12 and default FS9 libraries. The general layout of the airport (buildings, runways etc) is reasonably correct, and it will give a fairly good "feel" of the place. Any interest in this being uploaded to Avsim ??? Judging from the quality of your previous sceneries - absolutely! I remember getting one off AVSIM, by Rob Diebold if I remember rightly, am not sure whether it is still there, but it does the trick. Still would be great to see what you have achieved Lawrie. Ok, thats 3 yeses, so i guess i will upload it when its finished. Should be done within the next few days. Gisborne Airport has been uploaded to Avsim. I remember this at least at NZCH, NZNS, and NZPM. Are yours any better?